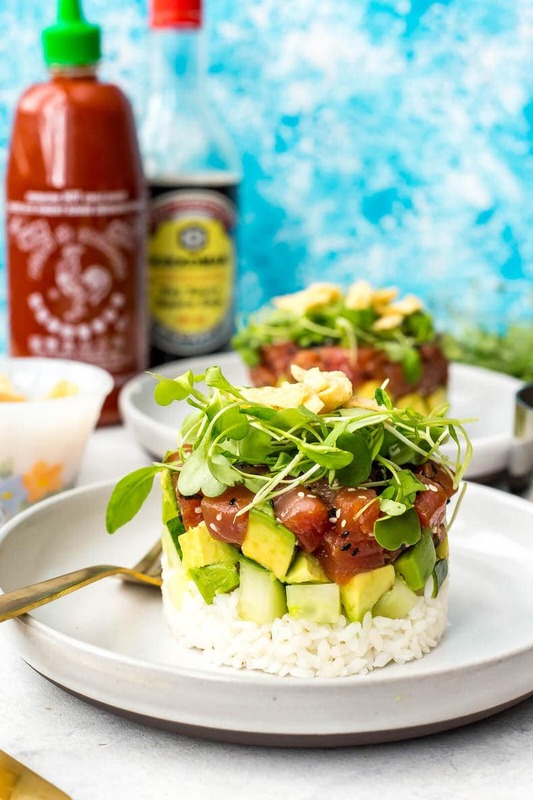 These Ahi Tuna Sushi Stacks are a delicious copycat version of the ones on the menu at Canadian restaurant chain Cactus Club Cafe - with a sesame-soy marinade, avocado, cucumber & micro greens, it's a deliciously light dinner idea! Cook sticky rice in a rice cooker or on stovetop according to package directions. Mix in rice vinegar, sugar and salt once done cooking. Let cool in fridge at least 30 minutes to an hour (I make it the day ahead then let it sit in the fridge overnight). Cut tuna steaks into 1/4-inch pieces. I find it easiest to freeze tuna for about 1 hour to get them to harden up so it's easier to cut them, but you can definitely cut them fresh if you're in a pinch. Toss tuna with soy sauce, sesame oil, nori strips and sesame seeds. Try your best to divide all ingredients in four. Add a bit of tuna to a 1 cup measuring cup, then layer with avocado, cucumber and sticky rice, pressing down hard on sticky rice with the back of a spoon. Flip measuring cup upside down on a plate so mixture comes out in a stack-like form. Top with microgreens and wonton strips, then serve and enjoy!